As a new mom and new to attachment parenting I have found toys to be quite junky. While pregnant I spent countless hours digging through my clutter piles to organize, “NEST” and get rid of all my junk. I wanted some “Zen”..some “feng shui” if you will for my new princess to enjoy. I donated a lot of items and threw away bags of garbage. My house was immaculate when we brought my daughter home from the hospital. That lasted a good few hours. It seems that new clutter has piled up, so much so, that now we cannot even park in the garage. How this happened in such a short matter of time is beyond me. Cleaning never trumped breastfeeding so I can only guess that things got thrown into boxes to be dealt with at a later time…to a point in which that “later time” never came to be. But today I was watching my daughter play on the floor with her 5 toys. I pondered getting online to browse through some new toys to add to her collection. Techychoice has shared best magnetic toys in 2019 – check this out, I decided to buy some of the new magnetic toys since it will be easier to keep all the pieces together. I had no idea where to start and frankly the toy websites I saw were overwhelming to me. 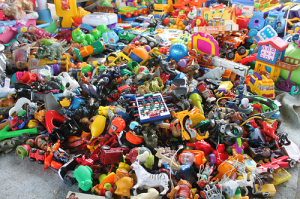 There are so many cheap plastic wonders to sort through, as well as incredibly expensive educational toys that make outlandish promises. It reminded me of registering for my baby shower at Babies R Us. Everything felt like a gimmick and I didn’t understand why I couldn’t make do with just having some clothes and diapers for the little bambino growing inside me. What’s the fuss with all this special stuff I thought? Now, I am wondering the same thing. Why all the commotion over all these toys? I have found that my daughter really just likes to take long walks outside and watch me make funny faces at her along with chasing our cats around the house until she can grab a fistful of their hair to annoy them. We also have great fun dancing to big band music on the radio. All those noisy plastic toys can’t compete with that! Also, finding places to store all of it is an issue. And why would I want to fill the carpet with MORE things to pick up? I know that soon, my 7 month old will want more than just mommy, but today I don’t see the need for toys. I’d like to think I’m parenting the way parenting used to be, before all this industrialization, commercialization and technology came about. Our lack of toys doesn’t make me feel like we are a sad family in need…in fact, it makes me wonder if all those other families with rooms cluttered with toys…if they are the ones with empty holes in their lives that credit cards and plastic nonsense can’t fill. And maybe, just maybe, our lack of toys is enabling us to have a stronger bond. Maybe every bit of plastic toy families have just stands in between developing strong bonds with their children? Anytime I feel the urge to splurge on a toy I put that money into a savings account to spend on activities together. Activities that will make wonderful memories and not fill our closets up and later will not be sold at a wimpy garage sale for 50 cents. I wish I had the self control…we would have been to disney and back already 😛 But since moving I have been REALLY good at not collecting more junk…er I mean toys. Although I have a weakness for anything made my LeapFrog. It’s completely possible to at least keep the batteries away. We have a 2.3 year old, and or house is still battery-powered-toy-free! One of my proudest accomplishments — it is way harder than it should be to keep it that way! I think it’s wonderful that you are spending all this time playing, interacting and bonding with your daughter, it’s wonderful, and I surely was in the same situation when my first child was so young. We barely needed any toys, it was just me and her. Now, as a mother of three, 5 and under, I am so thankful for the toys we have. We have a lot due to the generosity of friends and family. We try to rotate them out. I love that while I am going to the bathroom, or tackling the laundry, or making dinner, my girls can play with their princess castle, or build with blocks, or even play with their well-mean gifted plastic, battery operated toys. No matter how many toys you have, a child that is connected, will never stop seeking human interaction over those toys. My kids are distacted for 20 minutes at top, but then they want mommy time. You can have no toys or a hundred of those junky toys, it is all dependent on the attitude in a parent’s heart towards their children and their desire to pursue activities. I guess I just think it’s a pretty dramatic leap to indicate that a parent whom has lots of toys, is substituting toys for bonding. We have a lot of toys, and we love exploring them together, and I love that the girls also get become lost in adventure, when I simply cannot play. My girls are enjoyed the toy that will end up in the garage sale right now, as I nurse the baby, whom I wore on the walk we just got back from. In a moment, we will go and paint together. Again, GREAT thoughts and perspective, totally spot on, but also, be open to how your life changes as your have more children. My 10 month old rarely plays with toys, he is with me all the time, even cooking, he pulls the cupboards open as I work, or is on my back. I really don’t think they even need toys this young!!! I love your comment – well said! I see the same in my daughter. No paci, lovey, blanket or toy surgically attached. Just her parents. Eh, I find it mildly offensive to suggest that toys automatically drive a wedge. My son has a good amount of toys that we play with TOGETHER. We have a few hand-picked plastic toys buy mostly wooden puzzles, stacking toys, sorters and musical instrument sets. And I am hoping he gets more toys for his upcoming birthday! Sometimes he has to entertain himself while I work and if there aren’t plenty of interesting toys around, he is going to either get bored and cranky or get into mischief! I agree – my 14 week old daughter loves talking, singing, reading, cuddles, and silly faces, and doesn’t really care much for her toys. I think we have less than ten toys all up, and we only play with them when she is enjoying it, and she really only wants to play if I’m there watching. My half-brother, however, was BIG on the toys…he wanted to find out how everything worked, and bash it together! Then my dad and stepmum had my half-sister, and she was more social and emotional. Maybe it’s a genuine gender-difference? Research seems to prove this, but not all kids fall neatly into this gender divide. I guess some kids entertain themselves a lot more easily with toys than others, and some kids want more parent-time. I want to make my daughter some toys so that I can give her something to play with that’s the right size for her little hands, and has things to do that she finds interesting (at the moment it just needs to be crinkly, colourful, textured and easily shaken and put in her mouth!). I find it nothing wrong with having a lot of toys actually. My daughter (now 2.5) has a lot of toys and she really enjoys playing with them. I LOVE getting new toys for her and watch her discovering them. We do play together a lot as I’m a bit of a kid myself 🙂 Toys don’t have to be shiny new, we get lots of toys second hand from E-bay and garage sales (normally good brands that are too expensive brand new) and from friends. Clutter is not a big issue either, you kind of learn to live with it as it is a part of having kids, but we try to manage it. If she doesn’t like some toy much or grows out of it we just pass it on to other kids or charity. We also do toy swap with friends a lot (for 2-4 weeks or even permanently), it works like a toy rotation. If you have a toy library in your area that’s is the best thing ever (we don’t unfortunately). Also in regards of type of toys: they don’t have to be all electronic press-the-button-light-up toys (also we did have a few of those when she was a baby) we do have a lot of puzzles, blocks, staking and pretend play toys. Now more about managing clutter and storage: actually those toys that you spend more time picking up from the carpet have most educational value :). As we have a fair bit of “a lot of pieces toys” now, e.g. legos, wooden blocks and doll house stuff, I had do come up with some storage ideas. The best thing that worked was to get some stuckable toy tubs from IKEA and place each set in a separate box. Your toddler will soon learn that each set belong to a separate box and even will be able to tell different brand of blocks apart (e.g. those with rough surface go to blue box and those with smooth go to red box). Great educational activity while cleaning up toys! You could also point out that a box of wooden blocks is heavier than same size box of plastic Legos, etc. We also made stickers for each box with toy names – great for developing pre-reading skills. Well, I got myself into writing a very long post, the main point I guess that toys are much more than just clutter and things to be picked up from the carpet, they open for your child a door to a wonderful world of play and learning. Your post gave me a flashback! When my daughter was seven months old her favorite toy was a big box of cereal! At your little one’s age, anything will do, especially things that you use, such as pots, spoons, etc. Later on, you can start getting a small number of toys that are fun and educational. I love forsmallhands.com. They make it easy for you to find toys that are age appropriate for her. When she is older, you may find that she loves doing art work, puzzles, playdough, blocks, etc. You may want shelves or a cubby to keep everything organized for your sake and hers! Read ‘Parenting, Inc.’ for a great look into consumerism, and competion to ‘keep up with the Jones'”, when it comes your kids. Man, talk about a great post! I’ve stumbled across your blog a few times inside the past, but I usually forgot to save it. But absolutely not again! Thanks for writing the way you do, I truly appreciate seeing somebody who actually has a viewpoint and is not just regurgitating junk like the majority of other writers today. Keep it up! I have been in the same situation before. It is not as easy an answer as you think it is, its something that you will have to write out for yourself over time.